Roasted Squash with All the Trimmings. | Eat More Plants. Sometimes I’m really in the mood for butternut squash (or any thick, non-edible skinned squash) but I’m too lazy, or just don’t have the time, to peel it! When it comes to edible skin squashes like delicata or acorn, they seem so much more simple to me and I often steer towards them over the others. 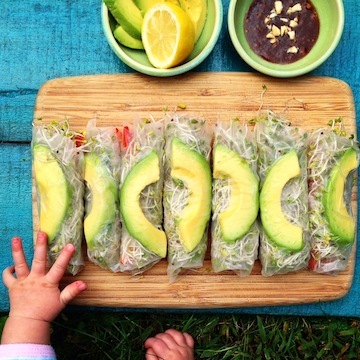 So…why not just stick them whole in the oven? Why am I always daunting myself with the task of peeling and dissecting the beautiful butternut? I have no idea. But from now on I’m just sticking it in the oven and roasting it in its entirety. Problem solved! I only have two more butternut squash from my harvest this year. A few wayward ones did get eaten by the deer but I certainly didn’t plant enough winter squash this year. I will have to remember that for next season! Last year, I was still eating my delicata squash well into February! 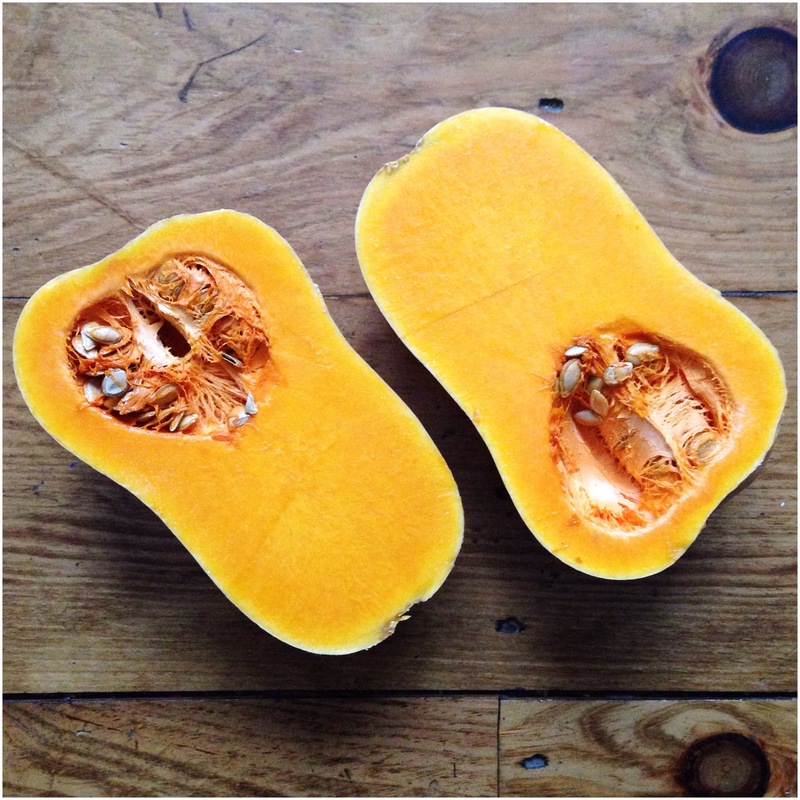 Winter squash is a great garden staple, as they keep well for months if stored in a cool, dry place. They don’t required much maintenance, if any, just well composted soil, a lot of space and about 6 hours of sun daily. I cut a large butternut (about 8 pounds) in half lengthwise and put it on a baking tray on the middle rack of the oven. No need to brush them with oil. For saving energy’s sake, I did two at the same time and saved the other one to make something else with. Roasted for 50-60 minutes at 400 degrees F and then left it in the oven for another 20 minutes at 300 degrees. Roast it until the edges are sufficiently brown and the whole thing is very soft to the touch. Another way to check doneness is to pierce the flesh with a knife; it should slide VERY easily in it (like butter!) when it is cooked through. 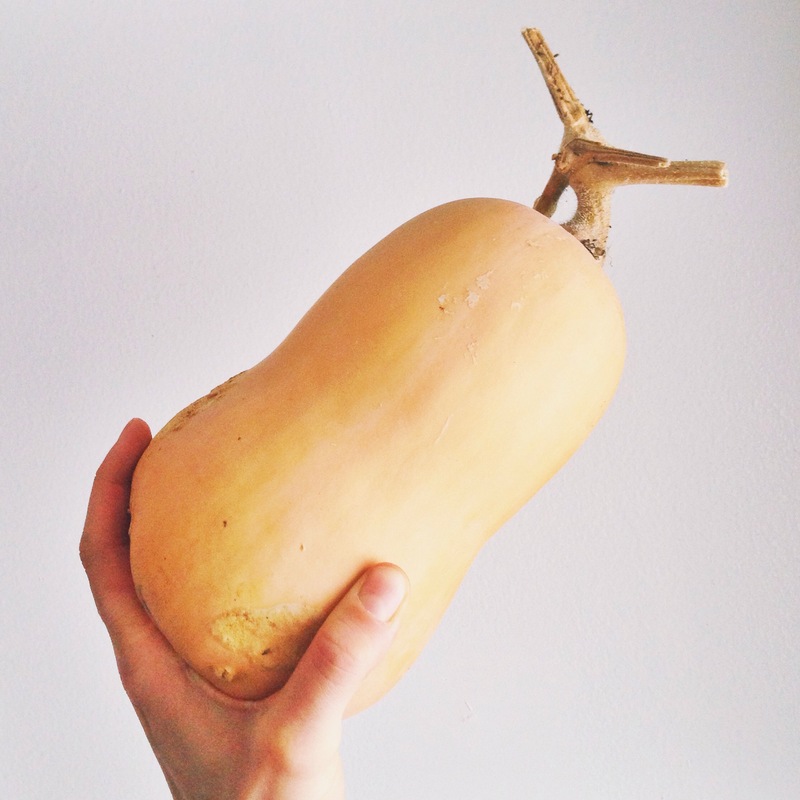 Take your squash halves out, scoop out the seeds (save them for something else) and put 1 teaspoon of miso and 1 teaspoon of butter or olive oil on each (add more or less depending on how big your squash is) and mash it in with a fork. The miso and butter will melt in from the residual heat. Sprinkle some chopped raw walnuts, fresh dill and a few green onion slices on top. No need for salt, as the miso seasons it enough. I spoke about the different kinds of miso in a previous post (miso lentil soup). If you still haven’t bought some, make this your reason to try it! I used red miso for this. Thanks for sharing such a beautiful blog! 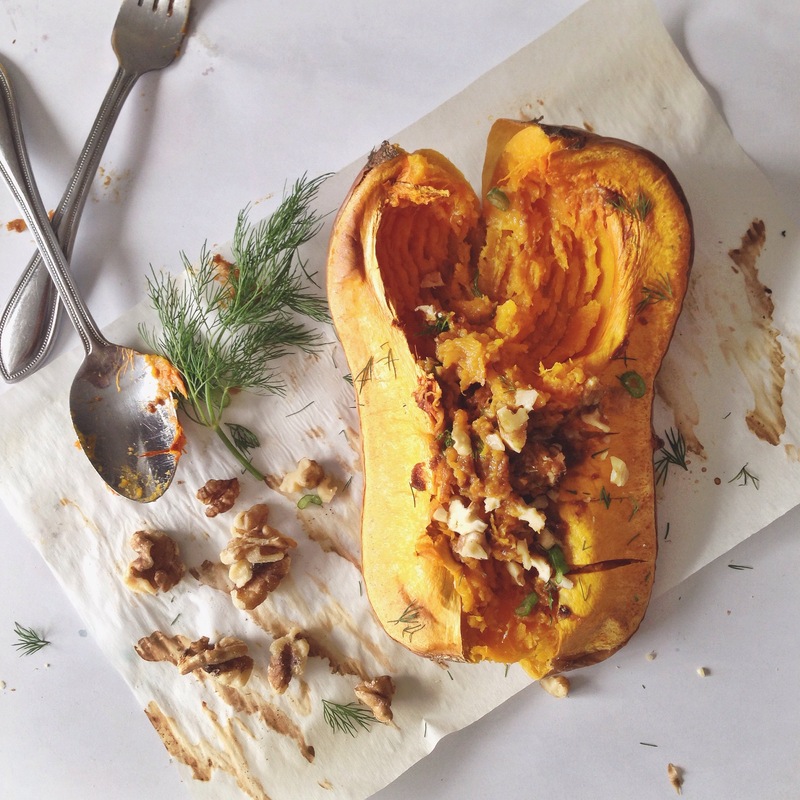 Seeeeeriously, I would eat so much more butternut squash if weren’t for all the peeling and chopping. This looks awesome! Haha right?! I don’t know why I never thought of doing this before ! !